Tai Nguyen opened the first Fleming’s in Newport Beach 14 years ago. Now the elegant restaurant chain has over 65 locations. Nguyen is the Operating Partner at Fleming’s Prime Steakhouse in Beverly Hills. I had the opportunity to enjoy a four-course dinner with him last Thursday night. 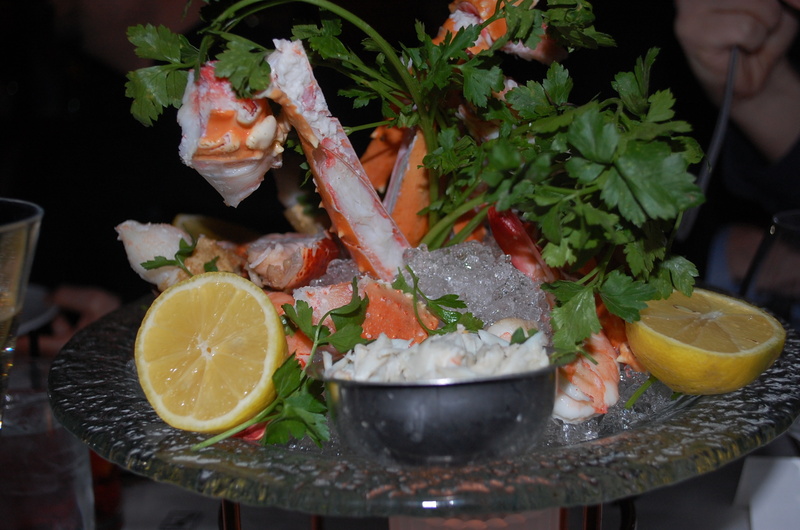 We started with a bountiful seafood platter dripping with ice and filled with Alaskan King Crab claws and legs, lobster tails and cooked shrimp. Four of us shared this dish as we dipped the jewels from the sea in Fleming’s cocktail sauce. 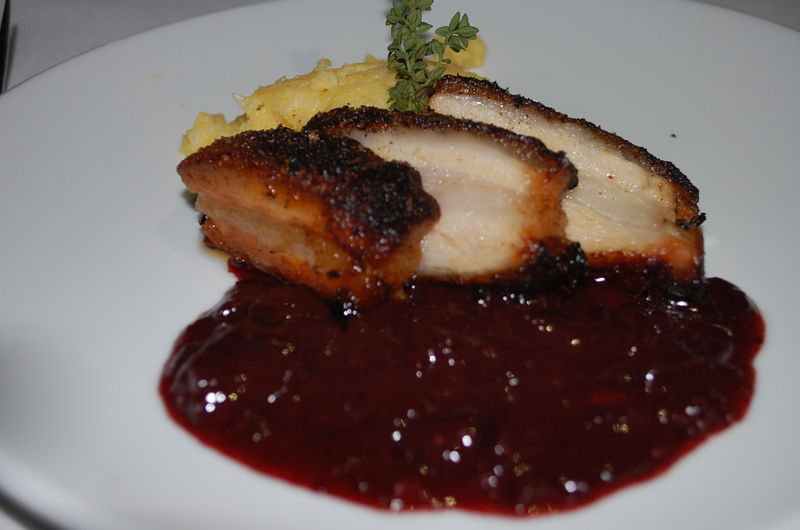 The pan crisped pork belly was served with a sweet burgundy onion chutney and creamy goat cheese grits. I paced myself by having a small bite of each, because I knew there would be a lot more food coming. This was paired with a ruby red glass of 46 Diamonds Cabernet Sauvignon. Tai ordered the Fleming’s salad, because he loves the candied walnuts. I ordered the New Wedge salad and was pleased with its presentation when it arrived. It’s a deconstructed wedge of crispy lettuce offers a hunk of blue cheese that I cut and speared onto a grape tomato. The large strip of caramelized bacon was cut and mixed with the crispy cooked onions. The Chef at this location is the adorable Brandon Powell. When he stepped out of the kitchen and entered the dining room, Powell received applause from the guests. Even though I was in one of the most popular steakhouses in the world, I ordered the Scottish salmon. It was barbecued with a slightly sweet glaze and served with a grilled mushroom salad. Tia ordered the same entrée and we both remarked that the fish was heavenly. My friend Toni ordered the Main Filet Mignon served with a béarnaise sauce. Its seared at 1600 degrees to offer a rich flavor. She enjoyed every bite. Across our table, a gentleman ordered the double thick pork rib chop served with an apple cider and creole mustard sauce. Two side dishes were delivered to the table. The Fleming’s potatoes are blended with cream, jalapeño bits and topped with melted cheddar cheese. They are exquisite. The grilled asparagus is a healthier option to accompany an entrée. Tai and I played with the iPad wine list. Tai said it’s the first of its kind at any Fleming’s restaurant. Select the “Choose a dish” tab and the iPad will offer at least three wines by the glass and bottle that pair nicely with that specific item. The Wine Director is the beautiful Maeve Pesquera. She selects over 3500 bottles of wine with over 350 varietals of wine and champagne for Fleming’s. Each restaurant offers 100 different wines by the glass. The Beverly Hills location also has a glassed in wine storage room that is climate controlled. It rests in the center of the restaurants and displays an impressive amount of wine bottles. 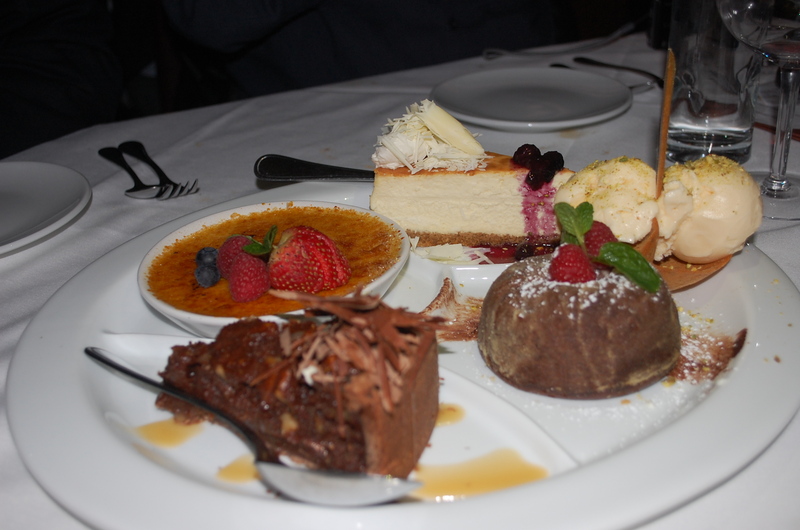 We finished with a selection of Fleming’s decadent desserts: cheesecake with blueberries, creme brûlée, chocolate lava cake, ice cream and wafer cookies and a sweet turtle pie. With Valentine’s Day approaching Fleming’s is offering a special dinner for loved ones. Start with a specialty cocktail of a Venetian Valentine of Mint to Be to be enjoyed with an Heirloom tomato and house made burrata appetizer. The chef will send out an amuse bouche of citrus marinated salmon tartar served with herbed crostini. Next choose a roasted lobster tail with vanilla lemon butter and crispy pancetta mac and cheese or Chateaubriand with creamy jumbo lump crab, topped with a Madeira sauce and accompanied with asparagus spears. This special menu is $69.95 per person. Finish the romantic meal with a rich chocolate budino topped with salted mascarpone whipped cream and add an additional $9.95.